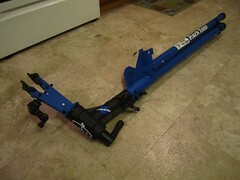 Last year for my birthday my wonderful girlfriend got me a Park Tool Home Mechanic Repair Stand PCS-10. Every cyclist’s home should have a bike repair stand, even if all you use the stand for is to wipe down the bike and lube the chain. Before I had my stand, I would have to flip the bike over, or try and balance the bike up with chairs or anything I could find. The PCS-10 is excellent quality just like all Park Tools. The stand allows me to work on bikes completely. At 22lbs, the stand when folded (according to my measurements) folds up to about 48in if you leave the clamp mount on, and is smaller if you take it apart completely. It can be stored anywhere. At 60in tall fully assembled at the clamp height, it lets you work on your bike at the proper height to do anything. The 2 legs fold down and click into place, and are then clamped with a quick release, keeping the stand stable in any position. The stand can be extended from the height of 42in to the max height of 60in. The clamp is a “Cam-type clamp [that] allows single action clamping of tubes 7/8” to 3” (24mm to 76mm).” This allows you to quickly mount the bike in the clamp. Then use the micro-adjusting knob to the ensure the bike is secure. 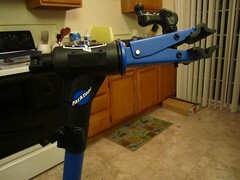 This is great, the clamp is easy to use, there is little fear of over-clamping and crushing the bike tubes. It is always better in my mind to clamp the seat post; it ensures that you will not crush the tubing on your bike whether it is steel, aluminum, or carbon. At 3in, the clamp is styled to also safely allows for those crazy aero-style seat masts on carbon bikes. The clamp head can be rotated for any position and can be removed for storage or travel. 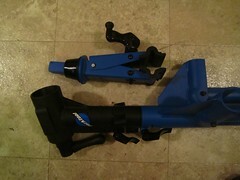 Park Tool also offers a couple different accessories that mount on the stands. I really enjoy this stand and without it I would not be able to work on bikes at home so easily. 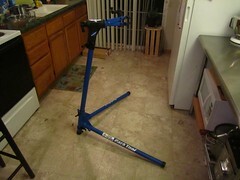 If you’re looking for a bike repair stand for your home or on the road, this is a great stand at a good price. Here is a video demonstration staring Calvin Jones putting the PCS-10 together. 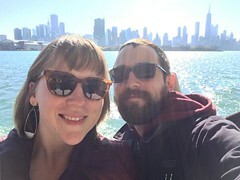 This entry was posted in BIKE, Reviews and tagged bicycle, bike, bike tool, Park Tool. Bookmark the permalink.